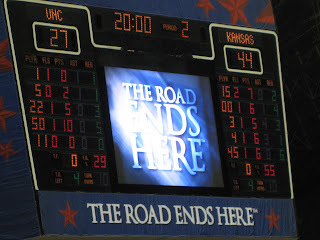 TheWirk.com ~ voted BallHyped.com's 2010 "Best Independent Sports Blog": UNC and Coach Williams can only go UP from here! I used to love watching ACC Sunday TV. Last night, I started to watch UVA v UNC yesterday and I fell asleep. Does that tell you anything? Ok - UVA v UNC isn't exactly a dream match-up, but ACC basketball is supposed to be exciting ~ right!?!? Correct me if I'm wrong, but isn't Duke or UNC supposed to be at the top of the conference standing? I caught a little bit of the Clemson v MD game earlier on Sunday, and I really think I heard the announcers say that Maryland was at the top of the ACC. Did I hear right, or was I dreaming?!?! Seriously?!?! What is going on here?!?! My allegiance and family loyalty tell me to root for Duke. Believe it or not, I'll cheer for UNC right after Duke, and Maryland takes 3rd. Maryland is in my top 3 because of its close proximity to where I live; and therefore, it's equals easier access to my 2 favorite ACC teams. Duke. I'm basically all talked out about them. They lost to Georgetown on Saturday. I saw that coming. Duke might be leading the ACC, but they are not the Duke team I want to "see". They are weak and not a scary team that strikes fear into the hearts of their oppoents. March is going to be rough without the intimidation factor. Maryland. Wow. They lost to Clemson at home yesterday. Oliver Purnell's Clemson Tigers are notching up some quality wins over their weak ACC rivals. I will never be a Clemson fan. I couldn't care less, but a win is a win. 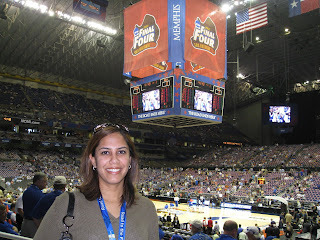 Instead, I'm recalling the 2008 Final Four in San Antonio. I went to the Final Four in San Antonio and watched the games with my brother. I had money on the Tarheels, since I was in Vegas the weekend prior and I even carried my betting slip in my purse to San Antionio. I thought I had the money in the bank, but it's a good thing I hadn't already spent it. Damn. I watched one of the saddest Tarheel performances in tournament history. I couldn't believe my eyes, and I think as an ACC fan I even blocked most of it from memory ~ since I can't remember who beat them, but I can sure as hell remember that UNC lost. A month or so later after the Tourney, I was working in Raleigh, NC. I was at RDU and waiting to go through the TSA security line. As I waited, I did what I always do... I looked around to see if I "knew" anyone in line. Why I do this, I'll never know ~ but I always do it, and to be honest, with as much as I travel, I always seem to find someone who's face I recognize. Sure enough Coach Roy Williams was in the line next to me! Hmmm... Ok - be cool, Sarah... I'd never really been a fan of Roy Williams. For some reason I never liked Kansas. Not sure, why. Just never did. 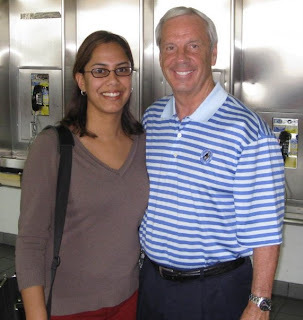 But even though I wasn't a personal fan of his at the time, even I knew that a chance meeting with Coach Roy Williams was special. Coach was looking around also and I caught his eye. I did what I always do... I waved and then I started with charades. I made the motion that looked like I was taking his picture with my fake camera and pointed to the waiting area at the end of security line, then just smiled. He smiled and nodded yes. Yep, I was all set. I would get to meet Roy Williams! His line was moving faster than mine. Story of my life... Lol. To kill time in line, I started to text, every UNC fan I knew to tell them who I was going to talk to, since I thought it was very cool. Coach finished going through securityy before I did, and he was gracious enough to wait and point to the shoe shine area. I get through the line and wait a couple mins for him to finish up. By that time other people noticed who he was and there were a few people waiting with pens and paper for him. Once his shoes were shined, he signed a few autographs and then I had my turn. He posed for a picture and we talked while we walked towards our gates. I told him I was a fan of the ACC and admitted to him that I was a Duke fan because of my brother, but followed up and told him that I respected UNC's program. He smiled. We kept walking and then I told him that I was at the Final Four and watched his team lose. I told him I couldn't believe what I'd seen. Coach's face immediately sank. I managed to deflate him in less than 20 paces and I felt like crap. You could see it in his face. He was still feeling the hurt. He made some comment about how he couldn't believe it either. I honestly can't remember what he said, but til this day I can see the look in his eyes and feel the pain.